The conference was a success! Thanks to all participants for the learning, community building and advocacy. Register now for FREE lunch, TTC tokens & snacks. All are welcome. Please contact us to let us know how we can accommodate you. Making Noise! Learn. Act. Heal. Community Conference on Gender-based Violence is a gathering aimed at providing a space to explore interactive, practical, artistic and healing ways to address and prevent gender-based violence. The conference wraps up the three-year Making Noise! initiative which has engaged over 500 diverse youth and people who work with youth across the GTA. LEARN about strategies, tools and local experiences on addressing gender-based violence. ACT on what you’ve learned by applying knowledge and tips for addressing violence, getting involved with progressive movements, and expressing yourself through interactive arts based workshops. HEAL through self-care practices, getting connected to resources and supports, sharing stories, and celebrating resiliency. Featuring photography, video, and writings created by Making Noise! youth on gender-based violence over the years. Jane and Finch Theatre group Nomandzland, Spoken word by Ify and a musical performance Amai Kuda. Interactive, arts based keynote performance on Land, Colonization and Gender-based Violence. What are the links between interpersonal violence and race relations? How does the media reflect and distort violence that takes place in racialized communities? This workshop will focus on the media’s tendency to represent gender-based violence as issues that plague black and brown communities, while at the same time ignoring missing and murdered Indigenous women. 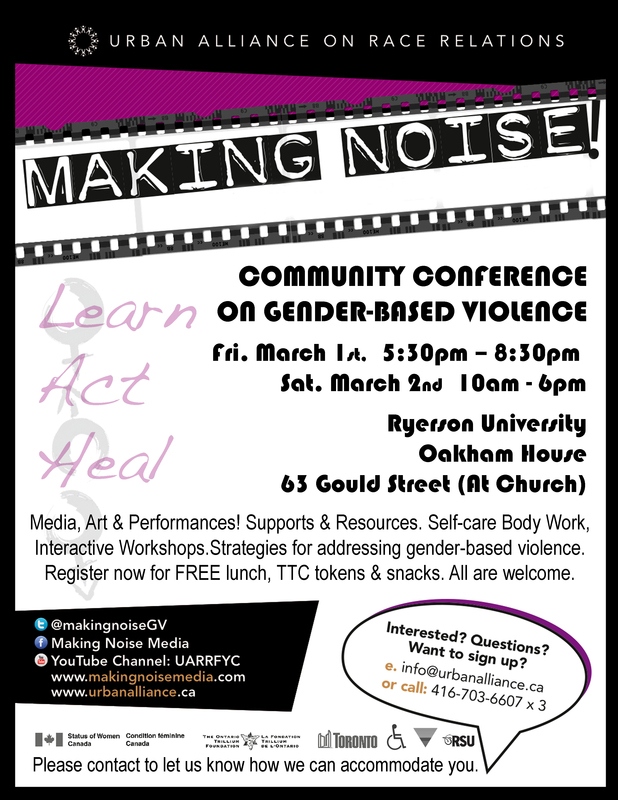 This workshop will explore how systemic violence impacts racialized communities, and the intersections of gender-based violence and oppression. Join the discussion on the effects of gun violence, community safety and policing in the city. Youth voices are central to this workshop. Addressing and surviving gender-based violence can have an alarming toll on one’s well-being. This workshop will explore strategies and resources for celebrating our resiliency and taking care of ourselves, and knowing when to ask for help. Relax, move, breath and release. Participants will have the chance to engage in hands-on sessions featuring various self-care and holistic health practices. This space will provide you with the opportunity to take time out for yourself for healing. Sign up during registration on the day of the conference to secure your spot. All participants must sign waiver. Sign up for a session of acupuncture and meditation. 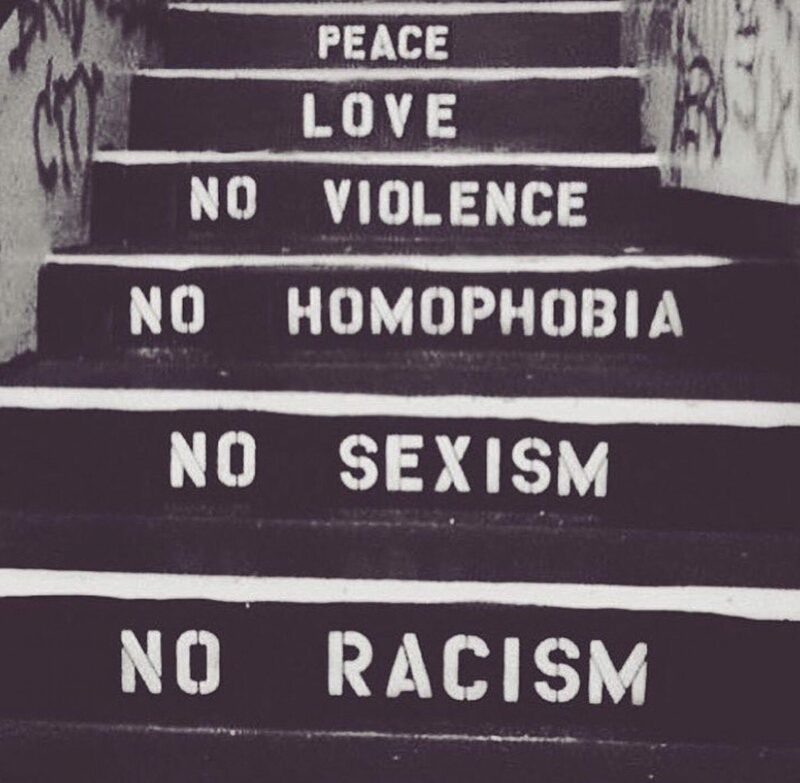 Gender-based violence is not just a women’s issue, it’s a community issue! This interactive workshop explores methods for engaging young men in addressing gender-based violence. This workshop explores gender-based violence, and its connection to homophobia and transphobia in racialized communities. It will explore the impact of colonization on LGBT communities, and methods towards strengthening and supporting diversity within communities of colour. Gender-based violence is often represented as an individual issue, but it’s an issue that affects entire communities. This workshop will explore different approaches to addressing gender-based violence in the spaces we occupy and the fluid communities we belong to. Relax, move, breath and release. Participants will have the chance to engage in hands-on sessions featuring various self-care and holistic health practices. This space will provide you with the opportunity to take time out for yourself for healing. Sign up during registration on the day of the conference to secure your spot. All participants must sign waiver. Sign up for a session of yoga and massage. Reblogged this on Urban Alliance on Race Relations.